Hey now, hey now, my bunting’s back. Again. So it appears Banksy’s troublesome wall mural will appear at auction yet again, having been withdrawn from sale in the US earlier in the year (if you’re curious, you can read more about that here) … and yet again, I ask – was Banksy involved in the ‘restoration’ of the previously absent bunting, and if not, will the auction house make note of their handiwork in their catalogue entry? What do you reckon the odds are? Somewhere between Buckley’s and none I’ll wager. I’m sure I’ve used that headline before. Actually, I know I have. But it’s too good to resist. Besides which – it was two years ago, and more of a subheading than a headline. Anyway, another to add to my ongoing file of copyright/authorship conundrums… (a couple more linked here and here). According to The Art Newspaper (TAN), Italian artist Claudio Capotondi has made inroads into the Chinese art world. 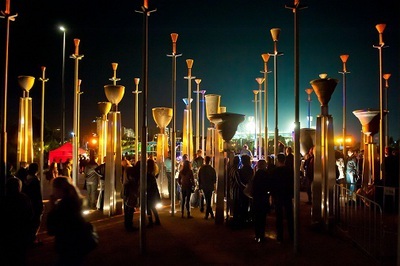 A version of the work he produced in 1978, Sferosnodo, was selected for permanent display at the front of a station in the city of Kunshan, China. The only catch? Capotondi had nothing to do with the creation of the sculpture on display in China. It is much larger than the artist’s own work, which he first made in bronze in 1978, and again in marble in 1983. He also had no idea the gargantuan version was being made. So according to this, blatant plagiarism can result in a work of art for which an artist can claim authorship, even if he or she had no idea it was being made, far less any involvement with its creation. OK. So, does that mean that Gucci is going to claim authorship for the dodgy knock-off handbags sold in the streets? Unlikely, because they wouldn’t want to acknowledge such shoddy craftsmanship. Not to mention, their trade relies on the premise of ‘exclusivity’. Does that mean artists will claim authorship of a stolen design only if the object produced measures up to their exacting standards? And does that mean that if I were to whip up a completely excellent Damian Hirst, that he would claim authorship, and I’d be in possession of an original Damian Hirst, rather than a derivative Meaghan Wilson-Anastasios? Of course, there are laws in Australia and internationally that would make the latter scenario more complicated. But I’m talking theoretically. Interesting opinion piece in The Age today by Australian artist Ben Quilty (link… here). In response to the recent raft of sporting-world scandals, he raises the question of why it is that sportsmen and women at the Australian Institute of Sport are exempt from the Higher Education Contribution Scheme (HECS) that applies to tertiary education in Australia (note: a couple of alumni pictured above). The refreshing angle in Ben’s article is that he isn’t whingeing about how hard-up the visual arts are in terms of public funding. Nor does he suggest that artists should be exempt from the HECS fees they accumulate while studying, or from paying taxes on the windfalls that occasionally come their way during the course of their career (prizes, bursaries, scholarships). But he does challenge the fact that, unlike any other students, the privileged few who make it into Australia’s elite sporting academy are exempt from HECS fees. Now, the argument of course is that people who commit their lives to amateur sport rarely if ever generate huge sums of money through their chosen discipline, and that there are tangible benefits to the Australian community when they achieve sporting greatness (think national pride, international profile, etc.) If there’s a benefit to us, the argument is that we should pay. And so we do – as taxpayers we fund the Institute of Sport, and those who attend it do so at the taxpayers’ expense. But as Ben points out, should we treat the contributions made to our society by our petulant and ill-disciplined men’s swimming team any differently from the contributions made by everybody from nurses to teachers, paramedics and police officers? Not to mention artists of all ilk? Because they all had to pay for their education. And in all instances, if their post-graduation salaries do not lift above a pre-ordained level, the debt they accumulate while studying is deferred until such time as graduates are generating enough income to repay the debt. Let’s face it. No doubt at all, it must be financially challenging for hurdlers and hammer-throwers after they retire. But not all the AIS graduates are in penury (witness: images above). The exemption granted to our elite athletes just doesn’t seem fair. Interestingly (depressingly?) enough, the only politician Ben mentions as entertaining the idea about the need for HECS equity is Malcolm Turnbull. Besides which, amateur sportsmen and women don’t have the corner on the “oh, poor me – we don’t make any money out of what we do for a living” schtick. David Throsby’s review of the economic circumstances of practising artists was called Don’t Give Up Your Day Job for a reason. Don’t get me wrong. This isn’t a ‘down on sport’ spiel. Some of my best friends are sports-people. Heh. Alternatively, just take the Banksy. Either way, I think someone’s been taking some creative licence with the disappearing Banksy that has just reappeared on an auctioneer’s rostrum in Miami. 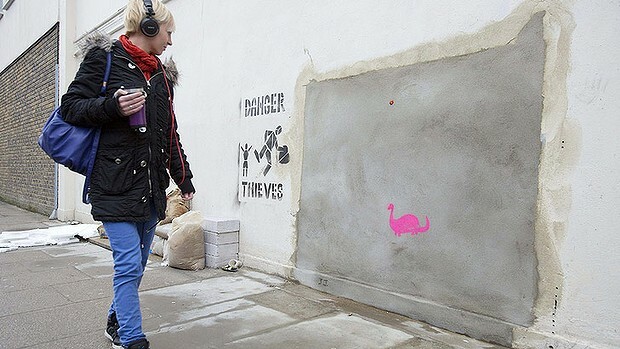 Fascinated as I am about the transformation of street art to commodity, I’ve written about Banksy and his compadres a number of times before… here, and here. So my attention was piqued when I heard about the chunk of wall removed in London’s Turnpike Lane and transported to Fine Art Auctions Miami (FAAM). 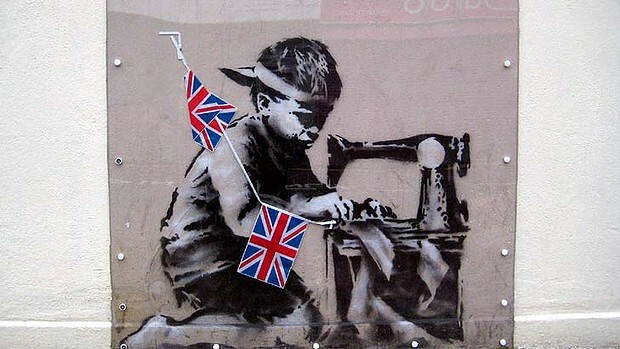 Of course, the otherwise unremarkable concrete render was embellished with a 2012 Banksy, an artwork that now has a title: Slave Labor (Bunting Boy). Given the non-Anglicised spelling of ‘Labor’ (vs. ‘Labour’), I suspect the title was conjured up by the American auction house rather than bestowed upon the work of art by its British creator. It also has a lot number and an eye-wateringly high estimate – $500,000-700,000 – for its appearance at FAAM (link to catalogue entry… here). I notice that when it was installed, the stencil incorporated actual Union Jack bunting (see the image at the very top of the post). But according to an article in the Mail Online, soon after it appeared, someone nicked the bunting. And so it remained. Until very recently. Compare the photos. The one immediately above shows the stencil in situ in London after the bunting went AWOL. Note: no bunting. And the image below, from the FAAM catalogue? Oh, look! Bunting. Who was responsible for that? 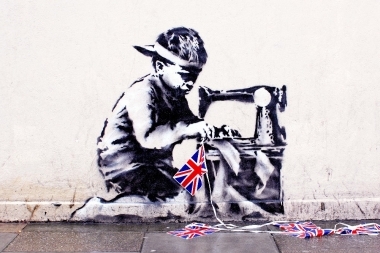 It seems highly unlikely that Banksy had anything to do with the ‘restoration’ of the work. If he was not consulted, which given his famous reluctance to even authenticate his works, seems unlikely to me, surely this represents fairly blatant disregard for his moral rights. Not that he would care too much, I wouldn’t imagine. But, really. Naughty, naughty. Whoever you are. Unless, of course, the auction house used a file image to illustrate the catalogue, which would also be very misleading. And it also means someone will need to whack in a string of bunting prior to the sale anyway to match the catalogue illustration. 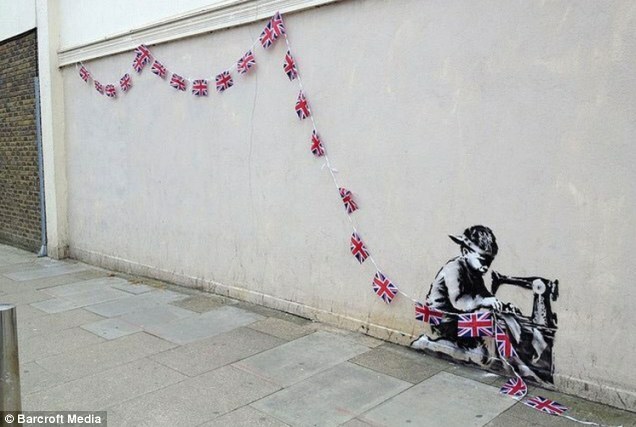 The stencil appeared in London in May 2012. General consensus was that it was a comment on the use of child labour (I remain a stickler for British spelling) in the production of memorabilia for QEII’s Diamond Jubilee. The choice of location was significant. 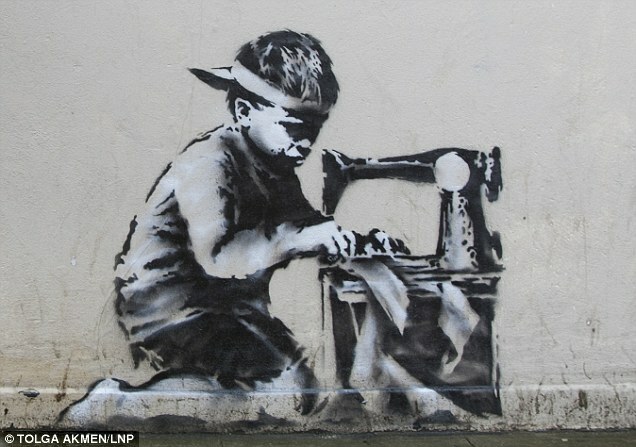 The shop Banksy chose to grace with one of his stencils, Poundland, was at the centre of a scandal in recent years when it was revealed that children as young as seven worked in the Indian factory that produced some of the things being flogged in the store. Quick post today with a link to a great article by a board member of the Philadelphia Museum of Art, Dr Luther Brady, in which he compares art authentication with the approaches used for medical science. My overall response to all your questions is that painting authentication is an inexact science. Given the number of people making a living out of playing the system and doing a good job of making forgeries that include all of the things that experts use to authenticate works of art, it is impossible for anyone to be 100% right 100% of the time. It all comes down to terminology – if the term ‘authentication’ is used, there is an assumption that an objective and scientific rigour has been applied to assessing authorship. Taking a different perspective – let’s think about it in the context of medical science. You have a sore gut and go to your GP. The GP offers an expert opinion about what may be wrong with you and provides suitable remedies and prescriptions. A week later, you’re still unwell, so you return – ie: your GP was wrong. GP sends you to a specialist, who also offers an opinion. Another week later, still sick (ie: your specialist was also wrong in the expert opinion she formed), you head back to the specialist, who recommends a biopsy. In the lab, what’s really bothering you is identified and a course of treatment plotted out. Lesson from this, as in the art world – no expert is ever 100% right 100% of the time. 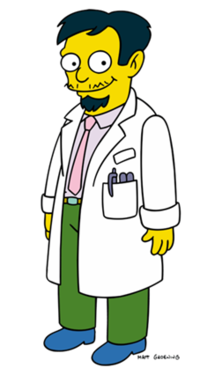 But the art world is particularly tricky as you have unscrupulous people setting things up to also fool the scientists in the lab, as well as fabricating ‘symptoms’ (provenance etc) to deliberately fool experts. The most effective way to authenticate a painting is to combine all three approaches – connoisseurship (expert knowledge of an artist’s ‘hand’), scholarship (examination of the historical record) and scientific examination. If all three boxes are ticked, there’s a better-than-most chance that the work of art is OK. But it’s still not 100%. There are too many variables.